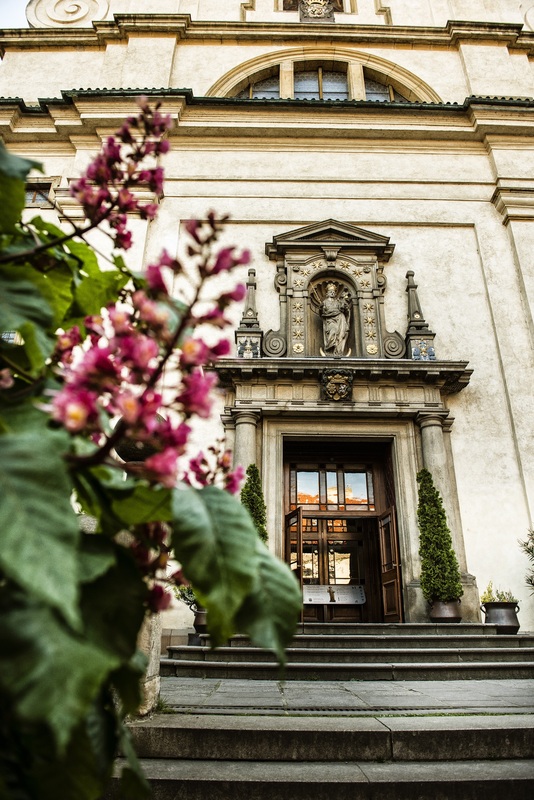 This Early Baroque building, dating back to 1611, was rebuilt from 1634 to 1669 by the Carmelite order. The church is famous for its statuette of the Infant Jesus of Prague, originally from Spain and donated to the Carmelites by Polyxena of Lobkowicz in 1628. The Infant Jesus has two crowns and about forty-six robes. His vestments are traditionally changed about ten times a year according to the liturgical season. A small museum was built for the clothing and other religious objects. Sightseeing is allowed except at the times of the masses. Masses for groups with a priest possible on order. The church was built in 1611 - 12 by German Lutherans, and it was dedicated to the Holy Trinity. We do not know the name of the architect of this first Baroque building in Prague. However, the building is a close resemblance of a church in Neubirg at the Danube by Rudolf’s royal artist Josef Heintz. It is likely that his concept was completed by an imperial architect Giovanni Maria Filippi. After the victory of the counter-reformation, Ferdinand II donated the church in 1624 to the order of Discalced Carmelites, who had merit in the victory of the imperial army at the Battle of Bílá hora. This order dedicated the church to Virgin Mary of Victory, re-built it and built a monastery nearby. The existing front was built in 1636 - 1644 at the expense of General Baltasar de Marradas. Originally, when the Lutheran Protestants dwelled here, the entrance to the church was on the side towards Petřín, and the altar headed east, customarily. To distinguish the Catholic style from the original Protestants, the entrance to the church was later built on the opposite side, i.e. from today’s Karmelitská Street. However, the Baroque style gradually placed more emphasis on the building as such than on the church’s traditional orientation. The Carmelites built an organ-loft in the originally simple single-aisle church, as well as a deep chancel, and they added a tower. By the monastery, they established a Seminar garden, where they kept frogs and fish in artificial ponds as food for the fasting periods. The Carmelite monastery was abolished in 1784 during the reign of Joseph II, and the church fell into the administration of the Maltese knights. At present, it is again administered by the Carmelites. 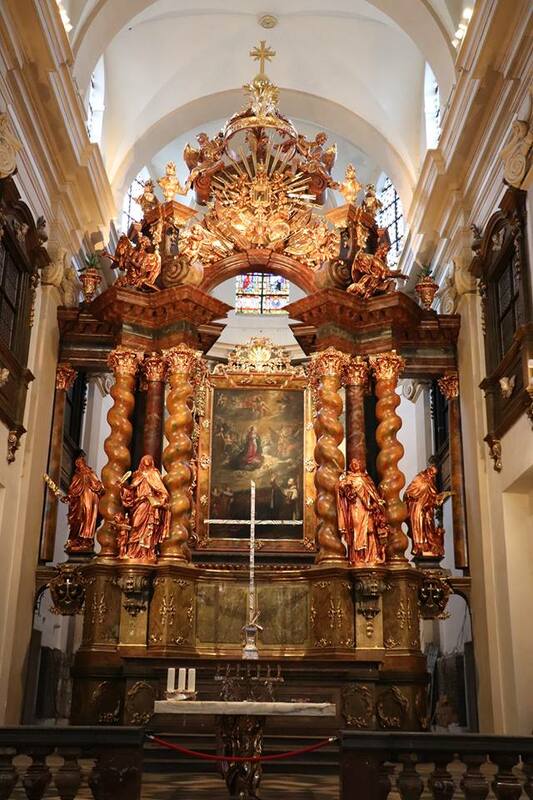 The main early-Baroque altar from 1716 is typical for variations of black and gold. It was modified by Jan Ferdinand Schor and it is decorated by a new statue of Madonna by Jindřich Čapek senior. On the chancel’s wall, there is a painting of Prophet Elias by Petr Brandl and the same author painted the pieces on the side alters: St. Joseph, St. Simon and St. Joachim and Anna from 1722. On St. Theresa’s altar, there are paintings by Johan Georg Dietrich and statues by Jan Jiří Bendl. Most pieces decorating the church’s interior originated in the 17th and 18th centuries. Left from the entrance, there is a late-Baroque font, which was brought here from the Church of Virgin Mary under the chain. There are three bells in the church’s tower. Two of them are original, even if recast. The bell with a deeper sound was made by bell founder Brikcích of Cimburk in 1595 and was named Jan Hus. When it was recast in 1829, the bell founder Karel Bellman named it Jan Křtitel (John the Baptist). The smaller bell’s name is Jeronym. Both date back to the time when the church was administered by the Lutherans. Only the third bell was acquired in 1718 by the Carmelites. Under the church, there is an extensive crypt from 1666 with coffins of the Carmelites and their supporters from the 17th and 18th centuries. It is in a bad state, because it was hit by water several times in the past, and a majority of the mummified bodies were damaged. Until 1716, more than 200 persons were buried here. Besides the Carmelites, there is also, for example, Spanish commander Don Baltasar de Marradas, Barbora of Valdštejn, the Dietrichstein family, but also famous beauty Terezie Fröhlichová, who, as legend says, died here on the day of her wedding with a groom she didn’t want. There are also several coffins with remains of children. Over the past years, the crypt was largely modified, with the original painted coffins with decorative forging being taken away and most of the mummies transferred. Only three best preserved were left here in glass coffins. The crypt is not accessible for public. Since 1628, the world famous statue of Infant Jesus of Prague has been installed in the church, known in Catholic countries as Bambino di Praga. In the mid-16th century, the statue was brought to Bohemia by the bride of Vratislav of Pernštejn, Maria Maxmiliana Manriquez de Lara. She later dedicated the statue to her daughter Polyxena on the occasion of her wedding with Vilém of Rožmberk as a means of protection of their family circle. Only after Vilém died and Polyxena remarried with Zdeněk Popel of Lobkowicz did she have a son named Václav Eusebius. The statue was traditionally to be passed on to a daughter, and so Polyxena donated it to the Carmelite order. Later on, the statue became legendary for its miraculous help during plague, plundering, etc. because the monastery remained unaffected on several occasions. During the Thirty Years’ War, the statue was lost and it was discovered again in 1638 behind the altar with its hands knocked off, and it had to be repaired. 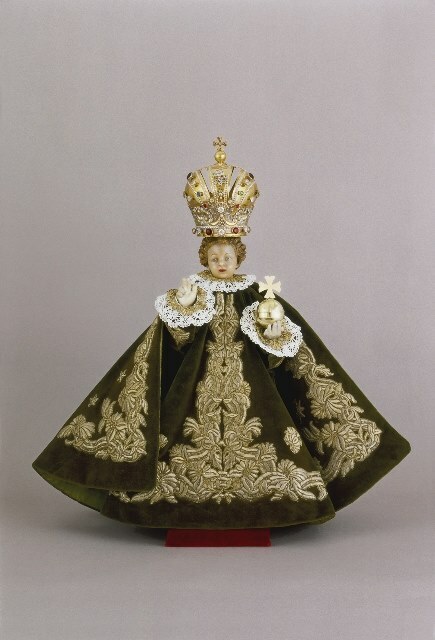 In 1651 it was taken in a procession all over Prague and it was attributed the name Gracious Infant Jesus of Prague. When the monastery was abolished, Infant Jesus was taken care of by the nuns from the order of English virgins. People have always turned to the statue with pleas for help, and it is most worshipped in Spain, Italy, countries of Latin America and in the Philippines. The statue of Infant Jesus even helped the missionaries in uniting the Philippines 400 years ago. The gift of the copy of Infant Jesus meant a common idol to the islands permanently stricken by fighting, and this idol meant unification. The famous wax statue is a 16th-century Spanish work. It is 45 cm high; the inside is coated with canvas and covered with wax. The hair was originally dark, later re-painted to fair. Its right hand is raised for blessing, the left hand holds a gold-plated globe with a cross; there is a large cross on its chest. It is placed on the middle altar on the right, which was made in 1776 by František Lauermann from artificial marble, and decorated by statues made by Petr Prachner. In 1741, goldsmith Jan Pakeni from Malá Strana made a silver case for the statue. Infant Jesus uses 2 crowns and approximately 46 robes. The habit of dressing the Infant Jesus is very old. Also the function of the cloakroom assistants is very old, being confided in English virgins since 1747. The robes are exchanged 10 times per year, depending on the season. For example, Easter means white robe, the Octave of Easter means red robe, Advent means purple robe, etc. The most significant robe is the one that was hand-made by Maria Theresa herself (green with golden embroidery), and there are also Chinese or Vietnamese robes, or robes donated in 1996 by the Spanish family of Manriquez de Lara, sewn from ancient clerical clothes, and many others. A small museum was established with the robes and other religious objects. On the 17th September 2007, a copy of the statue of Virgin Mary from the pilgrim place in Aparecida (Brazil) was placed in the side altar.